PTA's EL POLLO LOCO FUNDRAISER! NOVEMBER 7TH, 10AM-10PM! Join us for some fire-grilled chicken, yummy sides and warm tortillas, all while mingling with other Emery Park families and raising money for our school. This friendraiser is from 10am to 10 pm so come for brunch, lunch or dinner! 20% of your purchase will go back to Emery Park so this is a great opportunity to raise money. Thank you for your support and see you there! DONATE CLOTHING, TOWELS, BEDDING...ALL WHILE RAISING MONEY FOR OUR 8TH GR. CLASS! STARTING OCTOBER 1ST AND ENDING NOVEMBER 9TH, EMERY PARK WILL BE ACCEPTING USED CLOTHING, SHOES, QUILTS, ETC... AS PART OF A FUNDRAISING EFFORT FOR OUR 8TH GRADE CLASS. PLEASE SEE THE FLYER FOR ALL ITEMS THAT WILL BE ACCEPTED. YOU MAY DROP OFF ITEMS WITH THE FRONT OFFICE OR AT THE MORNING VALET DURING THE WEEK OF 11/5 THROUGH 11/9. THANK YOU IN ADVANCE FOR SUPPORTING THE 8TH GRADE CLASS! JOIN US FOR SOME GOOD EATS AND GREAT COMPANY, ALL WHILE RAISING MONEY FOR OUR SCHOOL! PTA is hosting their monthly friendraiser at Blaze Pizza on Main St., on Tuesday, October 16th from 5 to 8 pm. Bring the flyer in, or show it on your phone to earn 20% of all proceeds for our school! Hope to see you there! 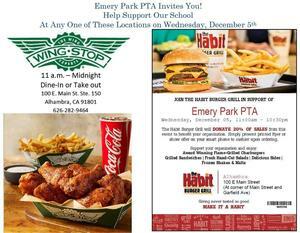 JOIN US AT THE HABIT & RAISE MONEY FOR EMERY PARK PTA! THE HABIT BURGER GRILL ON MAIN ST. WILL DONATE 20% OF SALES, ON TUESDAY, SEPTEMBER 25, TO BENEFIT EMERY PARK PTA. BRING THE FLYER, ENJOY SOME GOOD FOOD AND GOOD COMPANY! HOPE TO SEE YOU THERE! Want to take advantage of summer discounts? Here is a suggested supply list for our school.